Continuing my search for the perfect Chicago skyscraper (refer to previous posts here), I will now analyze a group of high-rises that I have placed under the name “Tall and Wise”. To counter all of the negative comments I have made in part 1 and 2 about Chicago skyscrapers, I intend to briefly explore some successful high-rises that were built after the great Chicago Fire and before WWII. Due to the importance of the projects, I will cover only a part of this group on this post and the rest on the next. Also note that not all of the buildings in this group are still standing, since it’s common to see great architecture fall victim to new development. One of the many jewels produced by the historic firm of Daniel Burnham and John Root. The building was one of those that, having been built so early in the evolution of the high-rise, it was a sort of experiment that is full of innovation. 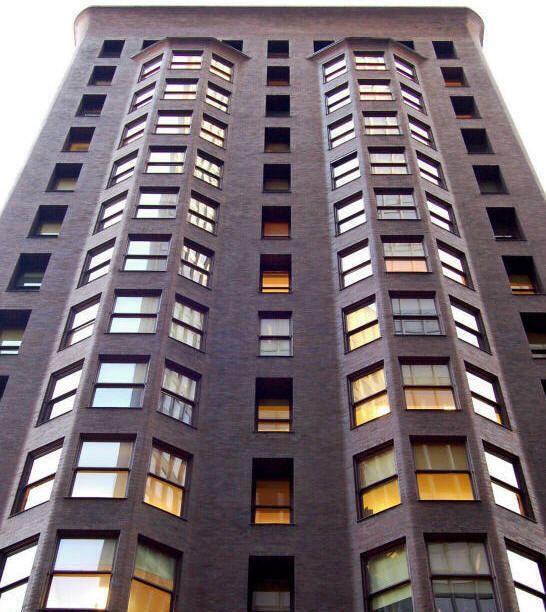 The tower, which was later expanded south by another great Chicago firm: Holabird & Roche, had to fit within the constraints of a difficult elongated site. The owner wanted his investment to take full advantage of the property, thus forcing the architects to occupy every inch of the problematic site and have as much leasable space as possible. What resulted was a long building with offices at both sides of a long central corridor adorned by beautiful cast-iron staircases capped by skylights. The Monadnock marks an important transition in the development of the high-rise. While most of the first part of the development was completed using large masonry walls to support the weight of the building, the south half was completed using a steel frame, thus becoming one of the first examples of “curtain wall” construction. Another important feature we find in this work of art lies in the simple and dark masonry work of the facade that, unlike most high-rises of the time, used little ornamentation and favored a type of simplicity that preceded, by decades, the modern international style. 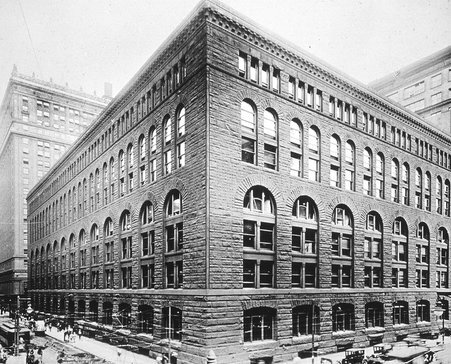 One of most successful Chicago companies boasts headquarters occupying one of the prime real state parcels of the city: the prominent starting point of the so-called “Magnificent Mile” of North Michigan Ave. facing the Chicago River. When analyzing this building I start with the site because it is what allowed the architects of Graham, Anderson, Probst & White to set the building apart from most of its counterparts. The tower responds to its context by turning its facade slightly to face the bridge spanning the length of the Chicago River, rising prominently in the horizon for all of those who travel north using the famous Michigan Ave. In plan, the building is not a rectangle but a trapezoid that manages to look slender, a quality that is often pursued to accentuate the vertical rise of skyscrapers. The project is also relevant because it boasts not one but two trapezoidal towers that are linked by a richly treated skywalk, thus allowing for a plaza to be placed in between, that serves as a circulation artery and as a open atrium that brings natural light into the offices. Lastly, it is worth mentioning that the masonry work is of the highest quality, proven by an immaculately white terra-cotta that has defied the pass of time, only needing one major restoration since the building was first completed over 80 years ago. Henry Robson Richardson, the architect and designer of the Marshall Fields flagship store, forever left an indelible mark on Chicago’s architectural history that has not been erased even after the building’s demolition in 1930. 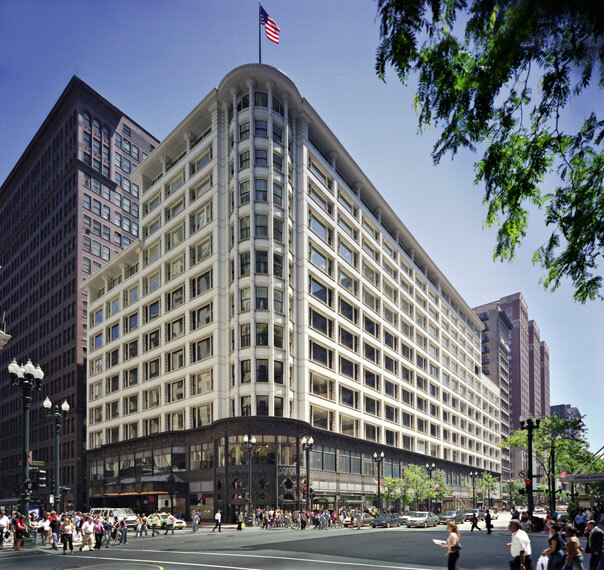 Sadly, the massive structure suffered the faith of an urban arrangement that had dramatically changed with the completion of the Merchandise Mart, bringing wholesale stores all under one roof. Richardson had created THE symbol for a very specific style of design that is often referred to as the “Romanesque revival” or “Neo-romanesque”, but aptly renamed “Richardsonian style”. The building fused, in its structure, iron and wood framing in a period where most high-rises still relied on massive masonry walls to be sustained. Such a innovative structural approach allowed Richardson to design highly textured facades featuring a series of arches that accented the vertical rise of the high-rise. The disposition of the facade also addressed the passerby, trying to diminish the impact of the scale on the city at street level. Aptly renamed the Sullivan Center as a testament to the work of its chief designer Louis Sullivan, the building has recently undergone a long and complex restoration to accommodate the reconfiguration of its function from being a famous department store to become an office building of the Internet age. Many would think that it is a stretch to call this project a high-rise but it very much is, given the fact that anything beyond 5 or 6 stories was unheard of until the late 19th century because it was unrealistic to expect people to walk up a staircase for that long. It was only with the elevator that taller structures became possible, introducing the term “skyscraper” in the English lexicon. In any case, Sullivan created a 12-story building of sizable windows that made the facade more transparent than most of its contemporaries. The design addressed the busy intersection of State and Madison street with a magnificent display of Sullivan’s organic cast-iron ornamentation and with a gently curved facade that eases the building’s presence on the passerby. The amount of detail and innovation that came with the sizable glazing units is also worth noting, not to mention the clarity of expression of the facade that suggests the building’s function and the steel frame structure that supports it. 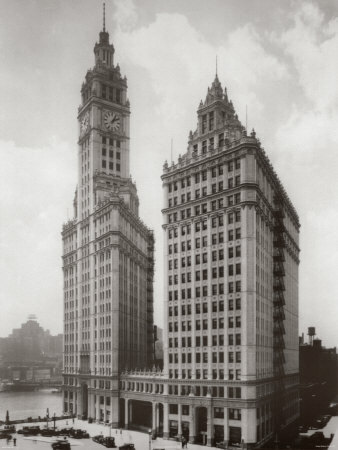 In the next post I will continue with more examples of the skyscrapers I have listed under “Tall and Wise” as I explore The Rookery, The Auditorium Building and The Reliance Building. Before I go, here are some other notable older buildings that are decent projects but that are not bad or good enough to be a part of my analysis: The Chicago Stock Exchange, The Mather Tower, The Palmolive Building (now Drake Hotel) and the Hilton Hotel.